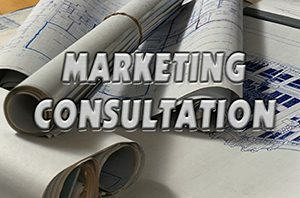 A consultation with a marketing professional is essential before the creation or production of advertising materials a commitment of media, or proposing a cost for promotional campaign. For businesses who have an on-going advertising campaign, a Marketing Analysis provides an outside objective evaluation which can offer alternative suggestions, improve performance and even reveal more cost effective concepts. Think of the marketing consultant like the architect that engineers the design of your home before the contractor begins to build. The marketing consultant assures an effective strategy will be developed, implemented and coordinated to avoid flawed, risky and costly actions. In the session the marketer is encouraged to present their ideas, engage the thoughts of partners and staff, present competitors materials and discuss sales and marketing problems. A seasoned marketing consultant will present solutions, explore options, and offer outside objective advice and direction based on their experience, creativity and expertise. The analysis: The first phase of the consultation is a comprehensive, objective evaluation or analysis of the marketers’ concept and capabilities. Tom Smisek CPC, has developed an exclusive comprehensive questionnaire used in the interview with the client. It defines your unique business profile and discovers factors and opportunities to capitalize on. In the analysis, an objective critique of the business structure, marketing elements, and advertising efforts are appraised and discussed. Marketing recommendations: The second part of the consultation addresses specific marketing problems unique to the marketer and offers concepts, ideas and suggestions to develop and improve the client’s marketing, sales and advertising campaign. Coordination with existing programs are examined for integration into a new marketing strategy. Together we explore creative alternatives and proven promotional methods designed to increase efficiency and cost effectiveness. Marketing Analysis Consultation, Marketing Consultant, Marlet Plan, Orange County California. Bookmark.